Joo Flacco has made his mark in the sands of time in American football, all thanks to his exceptional skills and creativity. Undoubtedly, Joe is a force to be reckoned when it comes to the quarterback position while in the field of play. He is currently associated with the Baltimore Ravens of the NFL, since the inception of his career with the Ravens; he led the Ravens to win the Super Bowl XLVII in 2013 while he received the MVP Award for his outstanding performance. Keep reading to find out more about Joe Flacco, his bio, family life, net worth, and other interesting facts below. 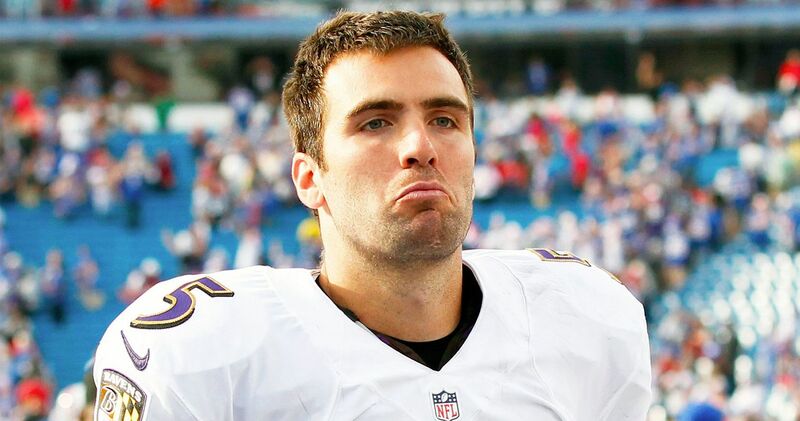 Joseph Vincent Flacco was born on the 16th day of January 1985 in Audubon City of New Jersey in the United States. He was born to American parents Karen and her husband Stephen Flacco and was raised along with his four younger siblings – Mike, Brian, Tom, and John. Just like Joe his younger siblings are equally successful athletes. His younger brother Mike played baseball professionally with the Baltimore Orioles and retired in 2013. John serves as a receiver for the Stamford Cardinals while Tom is currently playing his college football with the Towson Tigers of Towson University. In his early years, Joe featured both in baseball and basketball, before he finally focused on football. He played the quarterback position for the Green Wave football team of Audubon High School. Upon graduation, he was rated as a three-star athlete by sporting websites and was placed at the 39th position in his class. He went on to attend the University of Pittsburgh where he continued with his college career. He was placed as a redshirt in the 2003 season. Coming back the following year, Joe had a minimal playing time behind quarterback Tyler Palko. This led him to transfer to the University of Delaware where he got a better playing opportunity. He concluded his college career in 2007 after which he joined the 2008 NFL draft. During the 2008 draft of the NFL, Joe Flacco who was a top prospect in the draft was chosen by the Baltimore Ravens as the 18th player to be selected that year. He penned down a five-year rookie contract worth $30 million with the team. Joining Ravens’ roster for the 2008 regular season, Joe became a starting quarterback following the absence of Kyle Boller and Troy Smith. He made a lasting impression in his first game and for the rest of the season, he retained the starting quarterback position. He was honoured with the Pepsi NFL Rookie of the Year Award. The following season, Joe led the Ravens to the playoffs while scoring 25 touchdowns, 10 interceptions, and 3622 passing yards. He was equally rated among the Top 100 NFL Players for 2011. During the 2011 season, Joe recorded 20 touchdowns, 3610 yards and 12 interceptions. He got his big break in 2012 while leading the Ravens to clinch the Super Bowl XLVII. He was crowned the MVP of the competition following his excellent performance. Following his breakout season, Joe Placco became the fourth-highest paid quarterback in the NFL as he penned down a six-year contract worth $120.6 million. He continued to record significant improvement in his balling skills. In 2016, Joe got another three-year contract extension which will keep him with the Ravens until 2021. The contract was worth $66.4 million. During the 2017 season, Joe suffered an injury which ruled him out for almost six weeks. He returned to play afterwards and finally finished the season with 13 interceptions, 18 touchdowns, and 3141 yards. As the 2018 season is ongoing, Joe has given nothing less than the best for the Ravens. Net Worth: How Much is Joe Flacco Worth? Having a blossoming career, Joe Flacco is currently one of the big boys in the league. Although he is not the highest paid quarterback player in the NFL, he is occupying a top position in the table. The superstar currently has a net worth of $75 million, all thanks to his salaries and endorsements. He signed a whopping deal of $66.4 million which will keep him with the Ravens until 2021. His receives $22.1 million in salaries annually and several other millions from endorsements. Joe Flacco has been enjoying a blossoming football career; he is also a family man and a father of five children. The Ravens star is happily married to his high school sweetheart and love of his life named Dana Flacco. Just like Joe, Dana is equally from Audubon, New Jersey and they both attended Audubon High School. While they are there, the pair met each other in their senior year. From there they started their relationship which lasted for eight years before they finally tied the knot. Their wedding was held in 2011 and the following year, the couple welcomed their first bundle of joy, a son named Stephen in June 2012. After Stephen’s birth, the couple had four more children, a daughter named Evelyn and three sons – Thomas, Francis, and Daniel. For seven years and counting, the couple has been enjoying a blissful union. Despite the disparity in their height, they have proven to be perfectly made for each other. The talented quarterback is a very handsome dude with a great physique. Joe is very tall, standing at a height of 6 feet 6 inches (1.98 m) with an ideal weight of 111 kg (245 kg). His body measurements and shoe/feet size are currently not available. In addition, Joe has brown hair and brown eyes.